Refine Your Art – The mok yan jong is a very useful tool, designed to help refine your skills and develop proper structure, control of power, distance, and positioning of your Wing Chun techniques. 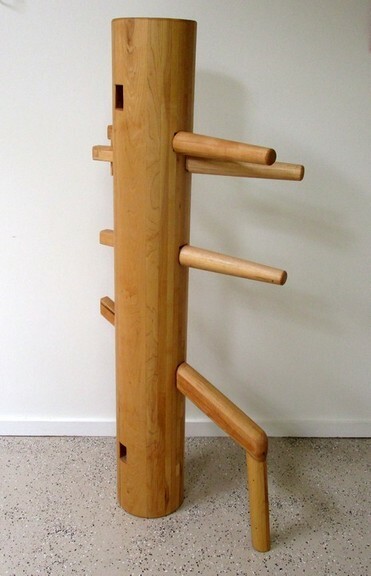 Traditional Wing Chun Dimensions and Design – 56″ tall, 8.5″ diameter, Avg. weight 90 lb. The upper arms can be made so that the left is higher than the right, or level (same height). Read more details about how I make the dummies in the “Product Description” below. 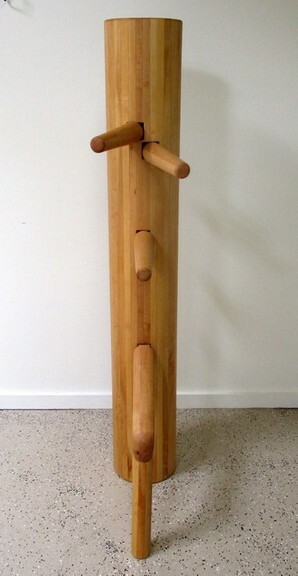 The wooden dummy must be mounted to a stand to be used. It can be mounted to most traditional floor or wall stands. * Please note – I no longer make dummy stands. Since there are a few stand manufacturers on the market, and making the dummies is my specialty, I am able to make more dummies per year if I don’t make the stands. SKU: 155. Category: Mok Yan Jong (Wooden Dummy). Tags: Jong, Mok Yan Jong, Mook Yan Jong, Muk Yan Jong, Wing Chun Wooden Dummy, Wooden Dummy. Raven Studios wooden dummy construction process – These hardwood dummies are made from Hard Maple. Twelve boards are used for the bodies, and the surfaces are planed to a glass like smoothness before being laminated (glued together). The boards are glued and tightly clamped together. Once turned round, the seams are barely visible. The process of laminating makes the Mok Yan Jong extremely durable and more resistant from cracking, which often occurs in modern dummies constructed from a single piece of wood. Laminating, when done correctly, creates a bond that is stronger than the wood itself. The result is a solid hardwood dummy body. They are not hollow. The arms and leg are laminated as well, with three boards. I choose the process of laminating hard maple for the same reason that the makers of fine furniture, cutting boards, bowling pins, musical instruments, architecture, bridges, flooring, and many others, use this same process and wood… long lasting durability, toughness, and strength. Hard maple is beautiful as well as durable, and laminating as opposed to shaping a single piece of wood, ensures that the finished product will be of the highest quality. A work of art that you can proudly pass down from generation to generation! The entire dummy is finished with a linseed and tung oil blend. The oil penetrates into the wood to provide a durable surface. Much stronger and longer lasting than a surface treatment such as varnish or urethane which can crack and peal off over time. Finally, the wood is hand buffed with a wood finishing paste wax for even more protection. The finished piece is quite beautiful and very smooth to the touch. Like any fine piece of wood furniture, wooden dummies should be kept indoors.